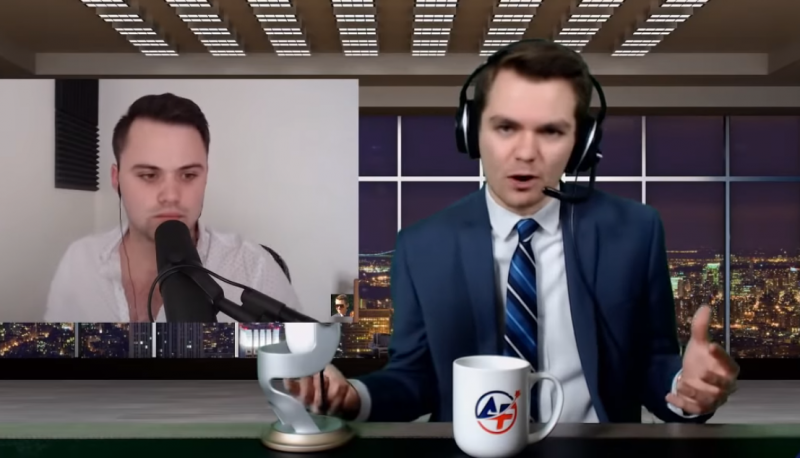 Nicholas Fuentes and James Allsup, two white nationalist YouTubers preaching to the so-called “alt-right,” are encouraging their young white nationalist viewers to seek local office so they may advance their movement’s influence in the Republican Party. During an episode of Fuentes’ show last week, the duo encouraged their followers to step up and claim open seats in their local Republican political offices. Allsup and Fuentes marched together at the 2017 Unite the Right rally and used to co-host a show called “Nationalist Review” before they split over disputes about the show’s direction and the transfer of some computer parts. Since their split, Allsup was able to quietly attain the office of Whitman County Precinct Committee Officer in the Spokane-area Whitman County Republican Party in Washington, and has succeeded in getting several officials of the local GOP to warm to his extremist ideology (although word of Cecily Wright’s pro-Allsup’s sympathies ultimately led to her resignation from her post as the party’s county chair). Allsup is an active member of the white supremacist group Identity Evropa. Many months later, Allsup and Fuentes seem to have made amends and appeared together on Fuentes’ “America First” show on September 7. At the start of the episode, Allsup and Fuentes encouraged viewers to seek office as Allsup did, and provided advice on how to do so. “They are leaving the reins of the Republican Party … open to the next generation and this is, I think, a project that we need to get more young guys involved in. If you’re an 18–year-old, 19-year-old, even if you’re 17 in many places, I believe, you can get involved. You can have a position of leadership in your county party, which doesn’t sound like much, but of course that then translates into positions of power in your state party, and then you become part of the national political stock,” Allsup said. Fuentes said that when he saw the news that Allsup had attained local Republican Party office, he had thought, “Damn, that’s the model. That’s the ticket. That’s the avenue for people who are conscious of what’s going on, who know the relevant facts, to actually be able to do something about it.” Fuentes said Allsup’s success, even with his profile as an infamous “alt-right” figurehead, showed just how easy it could be for others who are less known to do the same. Allsup cautioned viewers to “have an eye for—dare I say it, the ‘O-word’—optics” because if they start discussing “the ethnostate” at local Republican meetings that they will be “laughed out of the room.” Fuentes agreed, emphasizing to viewers that, if they decide to pursue positions within the GOP, they need to “play it close to the chest” when it comes to expressing white nationalist views. “It’s simply presenting yourself in a way that is ideal [in order] to exercise the levers of power,” Fuentes said.